George F. Thompson Publishing, 9781938086564, 240pp. On December 28, 2016, President Barack Obama acted to protect nearly 1.4 million acres in southeastern Utah as the Bears Ears National Monument. The monument preserves a landscape of unsurpassed beauty, filled with more than 100,000 Native American archaeological sites, some dating back more than two millennia. For the first time, tribes who look to Bears Ears for spiritual and material sustenance will work collaboratively with federal agencies to set policies for managing the monument. 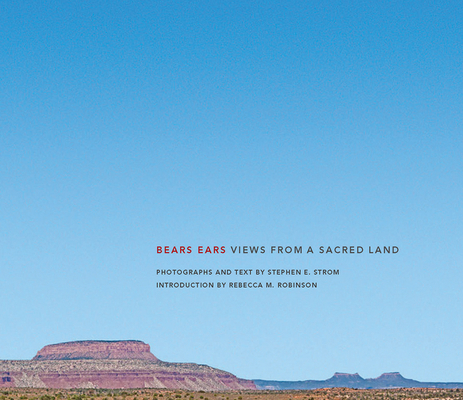 The photographs in Bears Ears: Views from a Sacred Land capture the singular beauty of Bears Ears country in all seasons, its textural subtleties portrayed alongside the drama of expansive landscapes and skies, deep canyons, spires, and towering mesas. To photographer Stephen E. Strom’s sensitive eyes, a scrub oak on a hillside or a pattern in windswept sand is as essential to capturing the spirit of the landscape as the region’s most iconic vistas. In seeing red-rock country through his lens, viewers can begin to discover the remarkable diversity, seductive power, and disarming complexity of Bears Ears’ sacred lands. Strom’s photographs convey what so many have fought to preserve for so long. Like the land itself, they evince the full spectrum of emotional responses: exhilaration and disorientation, contemplation and serenity, passion and gratitude for the wild places and archeological treasures that now belong to all Americans. Rebecca Robinson’s informative essay provides historical context for how the national monument came to be. Years from now, this book may serve as either a celebration of the foresight of visionary leaders, from Presidents Teddy Roosevelt and Barack Obama who have set aside lands such as Bears Ears, or as an elegy for what was lost. Stephen E. Strom received his PhD in astronomy from Harvard University in 1964. He has held appointments at Harvard, the Smithsonian Astrophysical Observatory, Kitt Peak National Observatory in Tucson, and the University of Massachusetts. His photography complements poems and essays in three books published by University of Arizona Press and one previous book published by George F. Thompson Publishing. Strom’s photographic work has been exhibited widely in the United States and internationally, and is held in several permanent collections, including those at the Center for Creative Photography in Tucson and the Museum of Fine Arts in Boston.